Steven K. submitted this photo and caption. John Mackey, a new popular composer, recently came onto the drum corps scene with the Bluecoats and Pacific Crest playing "Asphalt Cocktail" in 2010. In 2011 the Bluecoats will be playing "Harvest." Involved in drum corps and really liking his work, we couldn't pass up an opportunity to see him clinic our old high school. 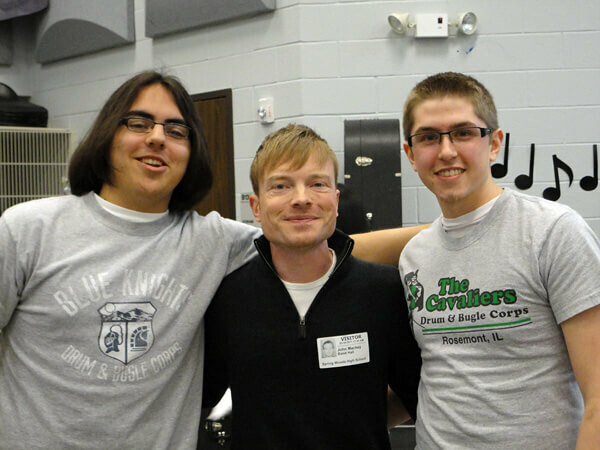 Left to right: Shane M. (Forte '10, Blue Knights '11), John Mackey, Steven K. (Crossmen '09, Cavaliers '11).